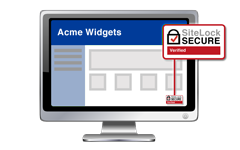 With SiteLock, customers will know your site is credible, trustworthy, secure and increased trust leads to increased sales. Show customers they can trust your site and increase conversions. Basic Spam Monitoring Checks your site daily to make sure it's free of spam lists. Basic Malware Monitoring Scans your site for malware that would block visitors. Basic Business Verification Validates that your business exists and can be trusted. 70% of online customers look for a website's security certificate before providing their personal information. Give your business instant credibility by displaying a SiteLock certificate. At $12.95/year, it's affordable security. Checks for cross-site scripting attacks, which allow hackers to take control of the code on your website to solicit personal information from your customers. Each field and form on your database is scanned to make sure there are no vulnerabilities where confidential information is stored. All applications (Flash, WordPress, etc.) installed on your site are scanned for possible vulnerabilities.